PMI Part 3: Continuing Certification Requirements – What Are They? The first two blogs in this series covered the background to the talent triangle and the areas outlined within each arm. This blog reviews the changes to the Continuing Certification Requirements (CCR) which were introduced in December 2015. As a result of the identification of the talent triangle and the recognition that the skills required to deliver successful projects are more than simply technical, PMI realised that the CCR would also need to change. There is now greater emphasis on education to reflect the research finding that the technical skills are difficult to find but very teachable and also improve the balance of skills. The changes are set out below. Each course offered now attracts PDUs in each category and one course can provide PDUs across all three arms of the talent triangle, depending on the content. Alternatively a course might only offer PDUs relating to one arm of the talent triangle. As shown a minimum of 8 PDUs are required for each arm of the talent triangle with the balance of 11 PDUs (minimum) being gained from any arm of the triangle. Over time this will develop skills in all three areas and PMI PPM Professionals will be recognized as having a broader skill-set than simply a PPM certificate. Education can be undertaken in more ways now too. Social learning, structured learning through classroom, virtual or e-learning and workplace learning are all recognized. The “Giving Back to the Profession” Category has reduced the number of PDUs to be gained simply through doing the job. We are always learning whilst undertaking our jobs, but this should not be confused with active development. This would vary considerably between individuals. Volunteering and adding knowledge to the profession are still valued and acknowledged as development activities. 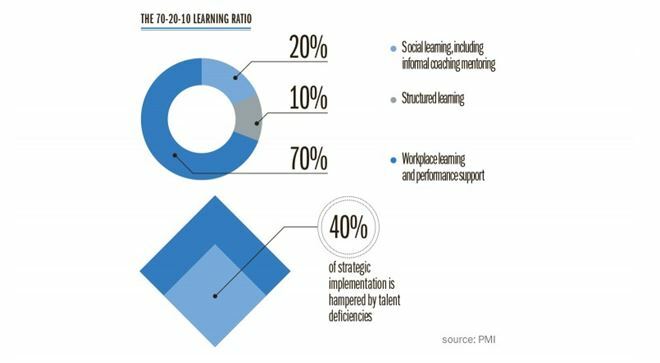 Professional development aims to address the 40% issue in strategic implementation which is hampered by talent deficiencies. Recording PDUs has also changed so each course you attend will need to record PDUs against each arm of the talent triangle. PDUs can now be gained for units down to 0.25 of a PDU, so if a topic is covered for 15 minutes you will still earn . If you have questions about how to earn your PDUs ask a member of the CUPE team on +44 (0)1202 555711.